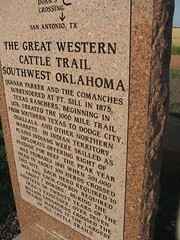 Quanah parker and the Comanches surrendered at Ft. Sill in 1875. 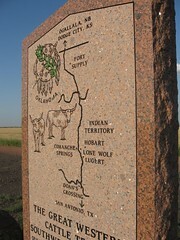 Texas ranchers, beginning in 1876, created the 1000 mile trail from southern Texas to Dodge City, Ogallala, and other northern markets. 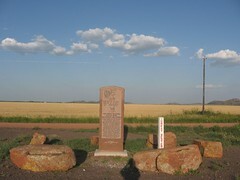 In Indian Territory, plains Indians were skilled as diplomats offering right of passage for beef. 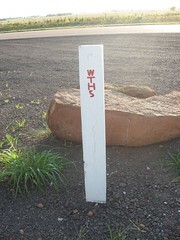 the peak year head in about 100 herds crossed this site. 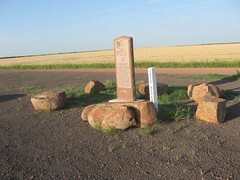 Each herd required 10 men and each cowboy required about 7 horses. 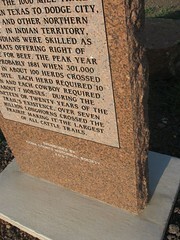 During the nineteen or twenty years of the trail's existence, over seven million longhorns crossed the prairie making it the largest of all cattle trails. 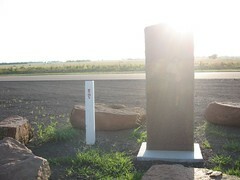 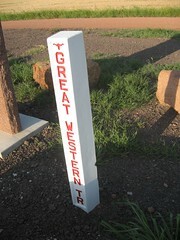 Next to marker: White fence post style marker for the Great Western Trail. 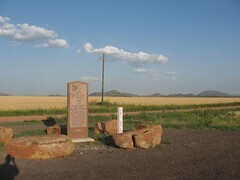 2 miles south of Lone Wolf, Oklahoma, on Highway 44, east side of road.